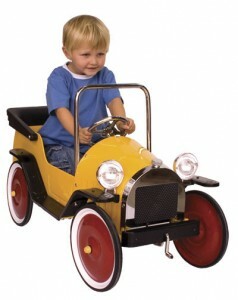 Quality wooden toys give lasting pleasure. They feel organic. They are robust and long lasting. Aside from their immediate play value they also represent an investment in childhood memories. An heirloom that can be passed on from generation to generation. Many of our toys are similar to those that parents remember with fondness from their own childhood. All are guaranteed to be fun and exciting as well as educational and helping to improve and develop motor and creative skills. But how do you know that what you are buying as gift for a birthday or Christmas is “age appropriate”? How do you know if you’re not just buying what you recall was your favourite at that age? That’s not just a question of pure safety, chemically safe paints and finishes and small parts choking hazards – important though those issues are. Just as essential is the question “will they like it”? Here we make a few suggestions so that you purchase a toy or game that will pass the test of the sternest critics of all – your children! Preschool age children are probably the easiest to buy for. They are enthusiastic about almost any new toy you care to get. If you want that initial excitement to last beyond a few plays you should still shop carefully. Stimulating, developmental wooden and soft baby toys have to be attractive, colourful and robust but above all have to be safe and suitable for toddlers and younger children. Every nursery needs baby rattles, cuddly toys and colourful building blocks that will stimulate younger boys and girls to develop skills through fun, play and discovery. Our best picks here cover items like the Alligator Boat that will give fun wet or dry. The ABC Bus is a sturdy play centre that encourages imaginative play and motor skills and dexterity. 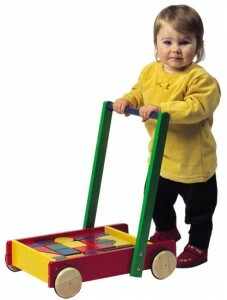 Baby & Blankie is a cute companion to any young child’s imaginative play and there’s also the classic Baby Walker trolley complete with 24 bricks to keep toddlers occupied on the move. Children in this age range are learning all sorts of new skills. They are starting to take off in reading, maths and refining their skills in art. Plenty of products are available that are fun enough to give as gifts, yet still manage to encourage and reinforce academic skills – genuinely learning while playing. It’s also at this point that gender differences start to become obvious. Girls and Boys will begin to show different interests and preferences. For your little girl for example the Rose Cottage Dolls House is delightful. Classic cream and pink and prettily painted inside and out, it comes fully furnished with 4 complete room settings with 28 pieces of furniture and a family of 6 flexible wooden dolls. 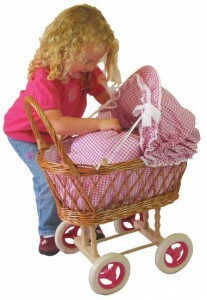 Our Wicker Pram will give hours of pleasure and is a truly beautiful object. Boys don’t miss out though. There’s a selection of Bikes and ride on toys and a stunning Vintage Pedal Car to stimulate the imagination of a future Lewis Hamilton. Now you’re talking hard work! Technologically savvy and notoriously difficult to please, kids ages 8 and up know their own minds and have probably already formed a particular hobby, interest or focus. They require extra attention when selecting gifts that will truly engage and hold their interest. Outdoor games and toys like Trampolines are always bound to be a hit. One of our most popular gifts in this age range is the Carpentry Set. It’s not really a toy, but rather a scaled down working version of the real thing. Packed in a tough solid wooden storage cabinet/carrying case its fully functional tools include a saw, claw hammer, pliers, chisel, screwdrivers, mallet, plane – in fact everything you’d find in a “grown up” carpenters toolbox. What do Kate Middleton and I have in common?